Posted by The Professor's Garden. Back in the day, May 1976, David and I met. After a road trip to Florida and a visit to Cape Canaveral, David was inspired to join the Air Force. His enlistment began in January of 75. I was in basic training during Thanksgiving and Christmas of that year and after Tech School I was assigned to Offutt Air Force Base in Nebraska where David and I worked in the same office. On our first date David took me fishing. He was a bit nervous and I watched in amused fascination as he struggled to tie a bobber to my fishing line. It was obvious that his Dad had never taught him how to fish. However, my Dad did teach me how to fish and although fishing consists mostly of sitting, drinking beer, and waiting while the tide laps the shore or slaps against the side of the boat, I knew how to bait a hook and put a bobber on a line. So I demonstrated to David the mechanical complexities of a bobber. I pressed the button, revealed the hook and clipped the bobber to my line. Thus began our 42 year odyssey of teaching and learning from each other. And although David did not know squat about fishing he is the most inquisitive and intelligent man I have ever known. I received an Associate Degree in Communication Design from Virginia Western in 2007. David has a History Degree from Virginia Tech and is two labs short of a Biology Degree. Although you might glean a microscopic grain of knowledge from these meager pages, David and I do not teach. One of David’s favorite authors is Willa Cather. Ms. Cather wrote a book entitled The Professor’s House. At this house the Professor had a garden. David was so intrigued with this book that the idea of naming our little farm after a place in this well written American Classic appealed to him. Back in 1994 David and I had a date every Sunday morning beginning at 10:30. We would make a pot of tea, cozy it, find something to nibble on and then turn on the TV to watch two of our favorite shows. One was Bob Villa’s Home Again with Riley. Riley, a carpenter, was one of my favorite TV personalities with his New England accent, bibbed overalls and two truncated fingers. The other show, my personal favorite at the time, was the beautifully presented, quiet, laid back but sophisticated, very informative Martha Stewart Living. While Villa and Riley explained building and home repair, Martha Stewart opened our eyes to the wonderful world of Different. At some point during the eighties I became aware of Martha Stewart’s existence. Her kitchen was featured in a women’s magazine and I fell in love, with her kitchen. I still have the pictures of her sixteen burner stove and the French doors leading to her greenhouse, tucked away in my dream-home file. After that article I started seeing Martha’s books everywhere, none of which I read because her lifestyle did not interest me. It was not until we stumbled across her show that Martha Stewart grabbed my attention and I painted my walls with her signature paint and in 2000 found myself standing in front of a seed rack with her name on it. There presented with open hands were the heirloom tomatoes Black Krim and Cherokee Purple. 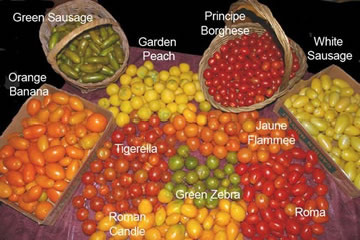 David and I had heard about heirloom tomatoes but because of regional influences we only grew the hybrids Better Boy, Supersonic, Jet Star etc. round, red, boring tomatoes. However, these heirlooms, one with green shoulders and dark pink skin and the other one, which was almost black, were definitely different and because of Martha Stewart we took them home along with a packet of eggplant. The standard Black Beauty eggplant never appealed to me, but these small white egg shaped beauties were intriguing. After we harvested those tomatoes and eggplant that year, everything changed. I went beyond Martha’s interesting but meager offerings and into the bountiful net. I started researching heirloom tomatoes and looking for sources. The next year I expanded my interest to include Asian eggplant, peppers, sweet and hot and anything exotic that would grow in our area. And every year since then I try to introduce something new, exotic or unusual to our market customers. David and I really enjoyed our Sundays with Stewart and Villa until a corpulent, pompous, self-centered Lynchburg preacher took over Martha’s time slot. I was infuriated. It was the first time I called a TV station to lodge a complaint and it was one of the many reasons that David and I were left behind when the country switched from analog to digital. Everything fades with time, even my interest in Martha Stewart. However, it can not be denied that at The Professor’s Garden we grow what we grow because of her influence. 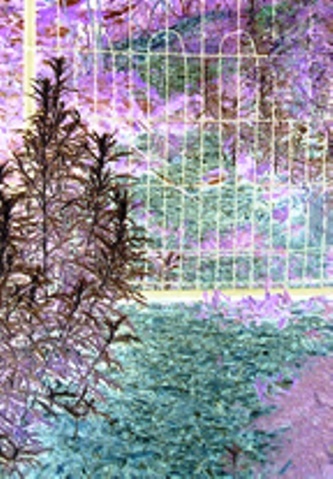 “The Beginning” and “Why we grow what we grow” were originally published on our wet paint site.